1 oz 2015 Star Trek Captain Benjamin Sisko Silver Proof Coin | ?? 1盎司2015年星际旅行Benjamin Sisko船长精制银币 This beautiful, colourized proof like coin has vibrant colours, a highly polished appearance and comes with a numbered certificate of authenticity. The mintage, including the two coin sets, is limited to only 6500 coins worldwide meaning that this is sure to become a prized coin for both numismatic collectors and Star Trek fans. Star Trek Deep Space Nine ran from 1993 to 1999. The series featured different themes compared to the previous Star Trek series, with much less exploration of physical space. The obverse of the coin features the Ian Rank Broadley effigy of Queen Elizabeth II and the words "Queen Elizabeth II 1 Dollar Tuvalu 2015" and the artist's initials. 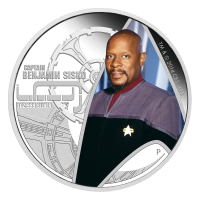 The reverse of one coin features actor Avery Brooks, in the role of Captain Benjamin Sisko. Sisko is pictured with the calm, commanding presence he brought to Deep Space 9 throughout the series. This coin, like the original run of the series, is strictly limited, get yours today before they are all gone!